Here we have a range of unique quality leather items. All of these are hand stitched, laced, tooled and finished by Marc Grady and now Mel Townsend and are therefore exclusive to The Longbow Emporium. Each of them can be personalised or monogramed to your own requirements. 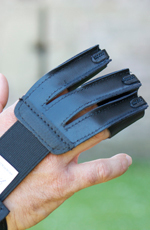 A choice of colours and tooling options are available on the Quivers and Bracers pages. These are just a sample and can be combined in numerous combinations for various effects, so please contact us to discuss your ideas. Alternatively, you can leave the design up to us and we will send you a nicely decorated item of your choice. Alongside these, you’ll also see quality leather items from the renowned companies, BearPaw, Gompy and Neet. Here we have a range of unique quality leather items. All of these are hand stitched, laced, tooled and finished by Marc Grady and now Mel Townsend. Many of these items make ideal gifts. See more images of Marc’s matchless leather work here. Quivers are an essential accessory for the archer and vary in their shape and size. 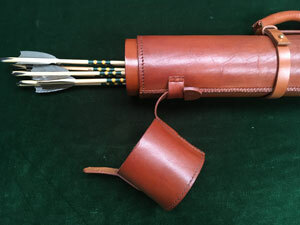 The Longbow Emporium quivers target luxury, functionality and distinction. We produce side, back and pocket quivers that are beautifully crafted and can be personalised to your requirements. 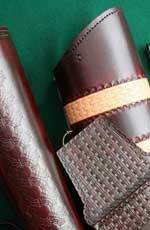 All our quivers are hand stitched and tooled using high quality leather. An essential item for protecting your forearm and for keeping clothing away from the string. Rich looking and comfortable to wear, our bracers are quick to lace and remove. All are beautifully crafted and can be personalised to your requirements. 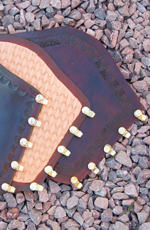 Why not match your bracer to your quiver design? Unique items for that extra special Christmas gift! welcome at ANY time of the year.